Pictured is Richard Musgrove, 38, formerly of West Street, Eckington, who has been jailed for 15 weeks after he was caught breaching a Criminal Behaviour Order by begging. A repeat offender who was caught breaching a Criminal Behaviour Order by begging in a town centre has been jailed. Chesterfield magistrates’ court heard on September 5 how homeless man Richard Musgrove, 38, of formerly of West Street, Eckington, was caught begging by police at Hollywell Cross car park, in Chesterfield. Prosecuting solicitor Becky Allsop said: “Musgrove was made subject to a five-year Criminal Behaviour Order on August 1, 2016, with a number of prohibitions. Mrs Allsop added that a police officer spotted Musgrove, on Monday, September 3, at Hollywell Cross car park, in Chesterfield, in front of pay machines and the officer switched on his body-worn camera. Musgrove was seen turning to a woman at the car park pay machines, according to Mrs Allsop, and he asked her if she could spare any change. 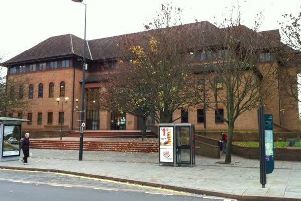 The defendant told police he was homeless and wanted money even though he was aware he was subject to a Criminal Behaviour Order and knew that he had breached the order. Musgrove claimed he has been homeless or in prison or living on the streets over the last ten years. Mrs Allsop said Musgrove’s latest offence was his 12th breach of his CBO and he is still subject to a suspended prison sentence from a previous conviction. Musgrove, who has previous convictions, admitted begging and breaching his CBO and also admitted breaching his suspended prison sentence. Defence solicitor David Gittins said: “He’s been living homeless on-and-off for the best part of a decade. “He was released from prison just weeks ago and his Universal Credit benefits have not yet been set up and the amount of money he gets on release from prison was not much and he wanted money for food. “One massive positive is that he was not in possession of any illegal substances which is a rarity. Magistrates sentenced Musgrove to 15 weeks of custody and he was also ordered to pay a £115 victim surcharge.